I recently served as a SAG driver in support of our local bicycling organization’s Surry Century. I started supporting (rather than riding) the club’s two annual events a few years ago. Later, I took possession of the club’s 14 water coolers. 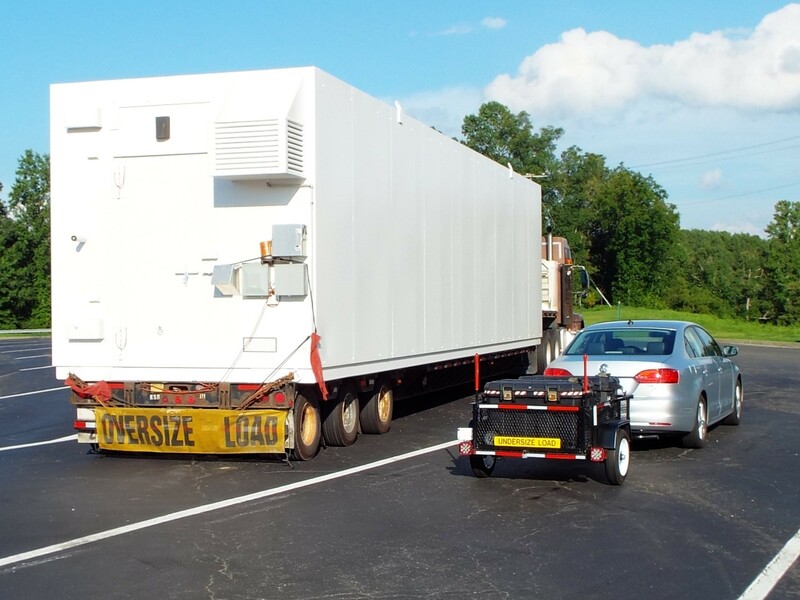 I had a 4×6′ utility trailer, so moving them was a cinch. 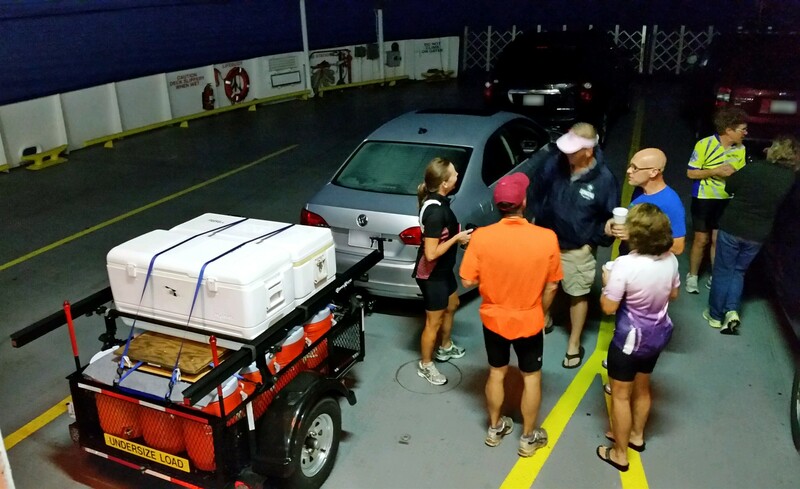 My event routine had become to deliver the coolers to prescribed locations, uncouple the trailer, mount my bicycle carrier (hitch-mounted) and then drive my SAG routes, restocking water along the way. I’d reverse the process at the end of the event, usually resulting in a really long day. Last year, I towed the trailer while I was SAG’ing. It was less time-consuming, although slightly cumbersome. I recently purchased an even smaller trailer. Transporting the coolers while making my rounds is now very convenient. The car/trailer combination is only a foot longer than an F-250 with crew cab; but it’s lighter, more nimble, and more fuel-efficient. I averaged 34 mpg over the course of 353 miles, including idling with the AC running. One of my other passions is Volkswagens. 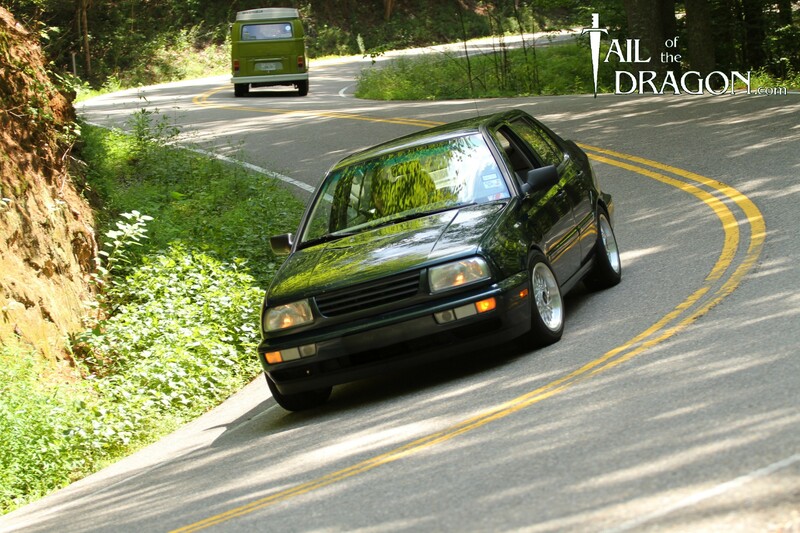 I have a dedicated website, StealthGTI.com, where I share my VW-related adventures, tuning choices, and photos with other VW enthusiasts. If you’ve noticed that I like to maximize the versatility of my bicycles, then it should not surprise you to know that I do the same with my Volkswagens. I drive over 30,000 miles per year, usually alone with some things in the trunk. A fuel-efficient and fun car is a great asset to me. I don’t need a truck, but sometimes I need to move things that are too large or dirty for my sedan. 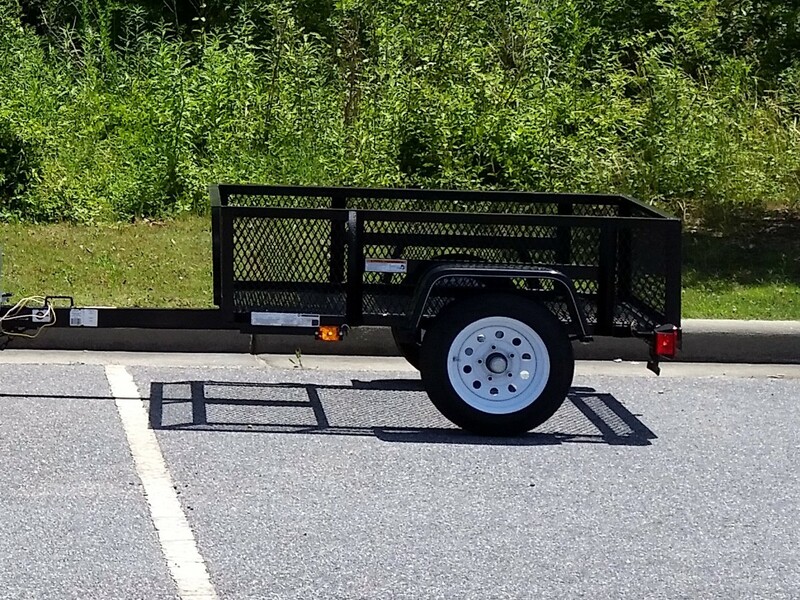 A small utility trailer is a great alternative for someone who doesn’t want the full-time mileage and maintenance penalties of owning a truck that’s actually used as a truck only a fraction of the time. Until now, my trailer was a “car thing” that I shared on my other website. It hadn’t occurred to me that I should share it here, too. I’ll take the time to tell you about it now that I know cyclists may be interested as well. Since I wanted a small trailer, I opted for Carry-On’s 3.5x5LSHS, a 3.5×5-foot trailer with 16-inch tall mesh sides. It has a 2000-lb axle and a maximum carrying capacity of 1700 lbs, meaning the trailer itself weighs ~300 lbs in stock form. It appears to be exclusive to Lowe’s Home Improvement. My wife immediately called it a “baby trailer.” It’s great for taking stuff to the dump or transporting dirty items that I don’t want inside my car. It’s like having a part-time pickup truck that gets 40 mpg. I couldn’t be more pleased with the purchase. Its immediate drawback was I could not see the trailer while driving. That presented a challenge when backing, but also made it easy to forget it was back there in traffic. The remedy was easy. I already had some guide posts that I used on my old trailer. Mounting them was my first change. Next, I installed a wooden floor because I remember how quickly the mesh floor warped under load with my old trailer. I also moved the spare tire carrier, tongue jack and Yakima “Top Loaders” (rain gutter adapters) from the old trailer before selling it. The new trailer was nearly complete. Of course, the bike rack itself is what got people talking and asking questions. I’ve used Yakima racks, mounts, and matching locks/keys for over 20 years. I use 1A RainGutter towers (they attach to the TopLoaders), 54-inch cut crossbars, and old Steelhead bike mounts. I bought a BT-76 tandem mount from Atoc several years ago. I opted to buy another BT-76 (I found a cheap one on eBay) so I could offset the outboard bikes and squeeze up to five bikes on the relatively short crossbars, with four of them facing forward. The BT-76 pair unintentionally act as side rails for larger loads such as the coolers in the top photo. 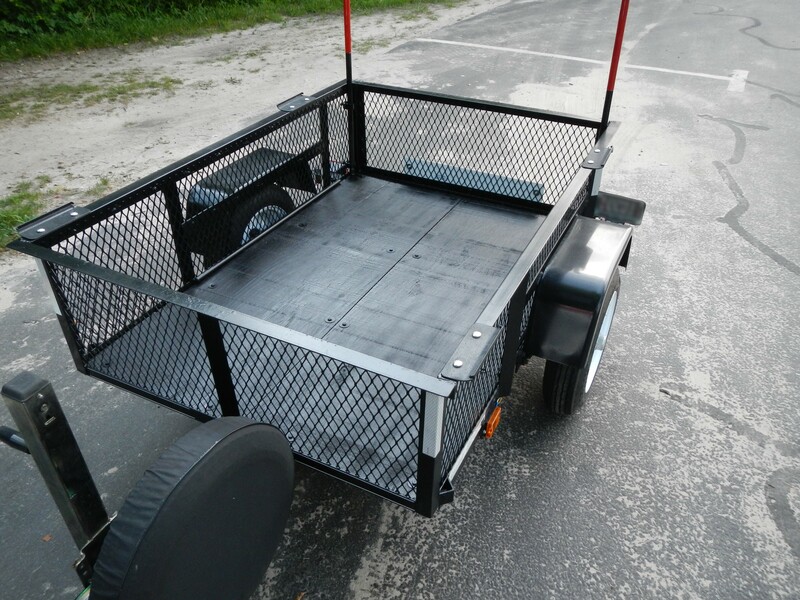 That’s it, the details of my “baby trailer.” It carries bikes and cargo without the wind noise, mounting hassles, overhead lifting, head knocking, or marred paint of a roof top rack while providing much of the versatility and positives of owning a small pickup truck. My setup can carry five bikes AND still have room for 30 cubic feet of cargo. The vertical clearance of the tallest bicycle is less than seven feet. It seems perfect for a weekend getaway for a foursome of cyclists. If I can’t find three people who can stand to be in the car with me for a weekend, then the baby trailer is still ideal as a SAG wagon and as a mini-workhorse (a pony? ) for a stubborn guy who won’t buy a truck. I recently read “An Unexpected Review: Carry-On 3.5X5LSHS Utility Trailer” and became inspired by your story. I have started to duplicate your process of building my own bike trailer with the 3.5X5LSHS Utility Trailer. I have a question: where exactly (in measurement) did you place your landing pads on the trailer? I figured you were intentional on the placement of them in efforts to distribute your load appropriately on the trailer. Thanks. Darren – I have several sets of TopLoaders mounted. Initially, and as shown in the photos, I had the front one as far forward as I could without allowing the TopLoader to touch the weld from the front angle iron; and the next crossbar was 38 inches back from there. Eventually, I re-spaced everything so I could have three crossbars, each being 24 inches apart. I figured I could carry more with three bars, even though Yakima doesn’t endorse it. BUT, I found that three crossbars really isn’t very practical and have since returned to the original 38-inch setup. 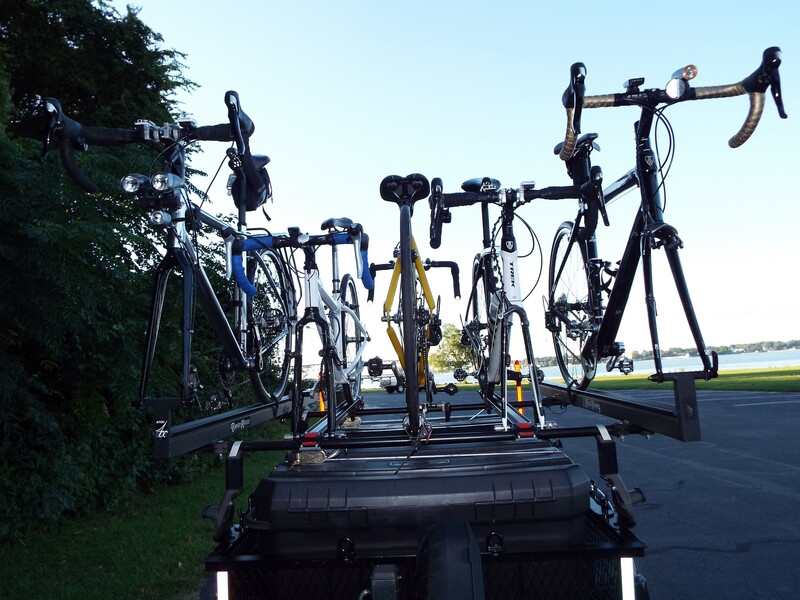 I biased the bikes toward the front of the trailer since the ride is smoother up forward. 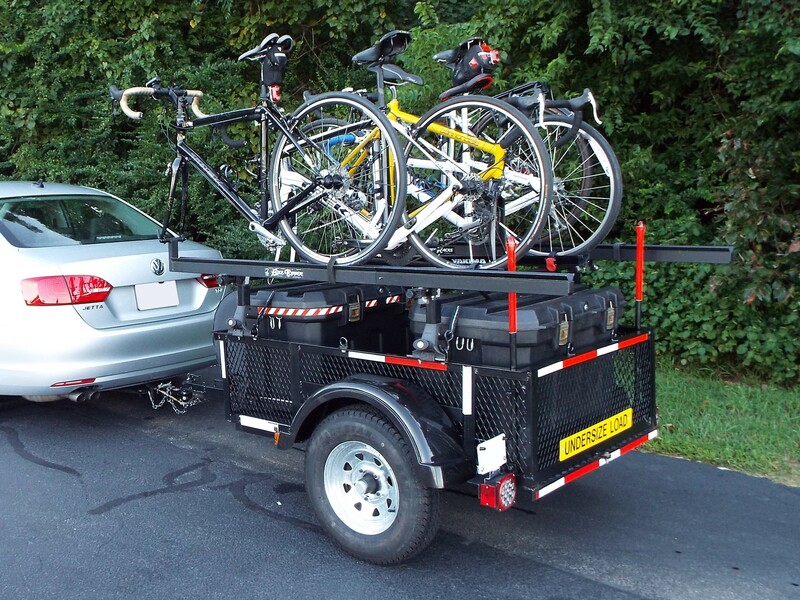 Recently in my search for a small trailer to tow behind my 2014 VW Jetta SE 1.8L Turbo, I ran across your review of the 3.5x5LSHS trailer you.use manufactured by carry on. I really appreciate the raving review you gave this small trailer as it has convinced me that it is the perfect trailer to make the long journey from California to Kentucky. Thanks for your review I hope that I get as much use with my trailer as you have gotten with yours. Thanks for the review. It helped me decide to go with the Carry-On trailer instead of a Harbor Freight trailer. I plan on modifying it for kayaks, which will surely be a light load. 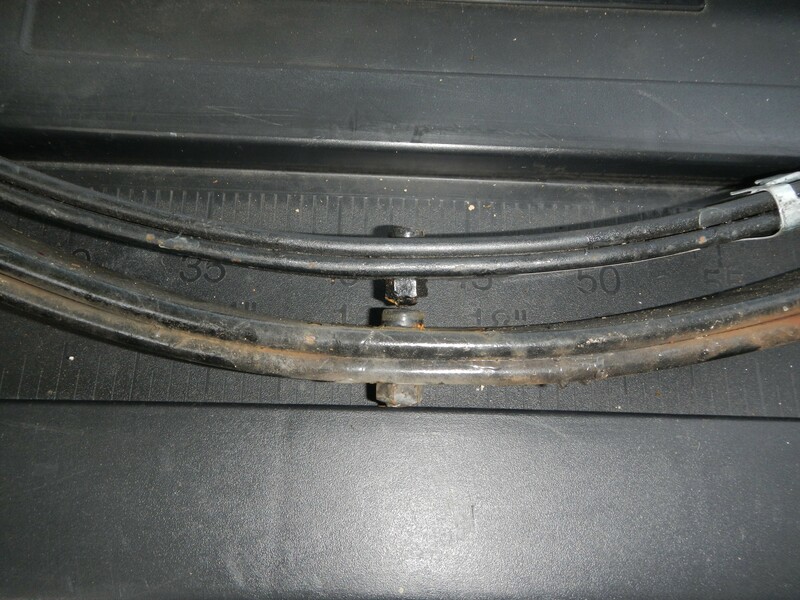 Could you please tell me, was the leaf spring swap difficult? I am thinking about doing it to my trailer. Just as a follow up (and since nobody ever tires of hearing this)– you were right. Replacing the springs was simple, taking less than an hour. Getting the springs, however, was not as simple. Etrailer.com no longer sells the WIC2 spring. Instead of letting me know when I asked a question about it, or even after I placed an order, they left me hanging for a couple of days until I discovered that they canceled my order without notice and contacted them. Convenient… heh…! Etrailer sells a replacement part, but it is not sized right. (24-5/8 vs 24-1/4). You can see the manufacturer’s item number right in their photo– UNA-177 (the same label appears on the WIC2). I couldn’t find the WIC2 at a reasonable price anywhere else, so the UNA-177 had to be it. I figured that if I was going to take a gamble on the length, price shopping was in order. Etrailer has the springs for $25.98 for the pair, plus shipping ($11.74 for me, so $37.72). I found the same springs at a place called SDTruckSprings for $13.90 for the pair, plus shipping ($15.79 for me, so $29.69). I got them in, and they fit just fine. I haven’t taken it for a test drive yet, but have stood in the back and jumped a bit. Much more flex, and I anticipate a smoother ride for my kayaks. Interestingly enough, the same company that makes the UNA-177 also makes a UNA-176, which is a 230lb spring. The trailer manufacturer says that it weighs 300lbs, so that would leave you with 160lbs of capacity, say 125lbs with some headroom. That may be a good option for someone who plans only to use their trailer as a means to pull something lightweight, but too bulky to fit on a car. Only one spec difference– the bushing’s inner diameter is 1/2″ vs. 9/16″. It looks like you can pickup the proper bushing from Amazon for about $9 for the pair (part PE-227). Where did you get the larger tires/ leaf springs? I didn’t realize that larger tire could be had in the 4.80 bolt pattern. Hi Scott, I am really inspire from your work on the trailer!! I am on the process to buy the same trailer because we are going for camping often and there is no place for all gears for a family of 3. I have read some reviews ( lowes Canada) about the trailer and few people they said that the trailer has rust problems. Is this true? What your experience of your trailer? Theodoros – “Rust problem” is subjective. Any steel trailer at this price point is going to have flaws in the finish, which leads to rust. It’s true that plenty of Carry-On trailers of all sizes (and possibly just about any other make of steel utility trailer) have rust after sitting in a rainy parking lot awaiting sale. I simply chose the specimen with the least amount of rust and then did some spray painting when I got home. My previous utility trailer got a new coat of black spray paint every spring (or every other spring). My 3.5x5LSHS has needed only minor touch-ups during the two years that I’ve owned it. Thank you Scott, I think you are right about rust…. Just now I came back from a lowes store to check out the trailor and as you said minor rust around because of been outside. My last question how the Trailer drives on highway? The trailer pulls nice and straight. I don’t think I’ve been as fast as 80 mph… what’s the point? 😉 But it pulls well at 75 mph or less. Keep in mind that trailer tires are rated for just 65 mph unless otherwise stamped on the sidewall. I have speed rated passenger radials on my trailer. Hi Scott, I drove the trailer(empty) yesterday from the lowes store to my home and the drive (with 50KM approx.) was not so pleasant! There where the road was not smooth (small bumps) the trailer was almost on the air, ready to fly! I am a little bit nervous now because I will drive the trailer most of the times on the highway! Maybe when the trailer will be loaded (an extra 150-200lbs) will be drive more smooth….I see your solution for a softer ride was to replace the leaf springs with 500-lb replacements and to swap-in larger 35-psi tires. If I will not follow what you did you think still I will be save drive on highway this baby trailer? Hi Scott, I hope you doing well. So far the trailer is great! I think I need your help. The light bulb in the tail is blown. What kind of bulb I am looking for replacement? Any specific name and volt? Thanks Scott for your post. I am purchasing the trailer also to transport kayaks and camping gear for weekend getaways. I own a 2015 Jeep Wrangler. I want to run the same tire and rim on the trailer as I have on the jeep, more for cosmetic reasons. What wheel spacer did you purchase and from where? In the future I would like to lift my jeep and run 33″ x10.50″ tires. Do they make spacers for that set up? What about the bearings and do you think the axle will handle what I want to accomplish. Your thoughts a greatly appreciated.